Windows 10 updates whether you want it to or not…unless you know the trick. An up-to-date PC is less vulnerable to attack, so Windows automatic updates are generally a good thing. But sometimes an update will make things worse, rendering a PC problematic, or even unusable until the problem is solved. That’s why some people prefer to hold off on a update until other people have tried it without disaster. But this requires you to take time out of your day to keep up on the news about Windows updates (a Google News alert can help). If you’re using Windows 10, you’ve got another problem: It won’t let you turn off automatic updates. Luckily, there are two workarounds. If you have a Professional, Enterprise, or Education edition of Windows 10, you can turn off automatic updates. But the option is hidden. Here's what to do in version 1703, if you have a later version of Windows 10 these settings still apply, but the wording is slightly different. 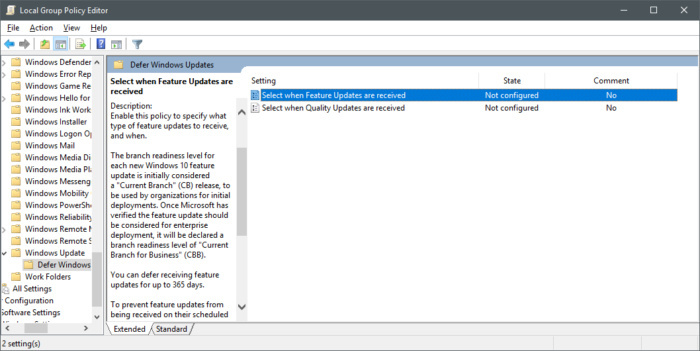 Computer Configuration > Administrative Templates > Windows Components > Windows Update > Defer Updates. Choose Select when Feature Updates are received. Group Policy editor in Windows 10 1703. In the Options box, type in how many days you'd like to pause updates and then in the next field type in today's date. Pausing feature updates in Windows 10. 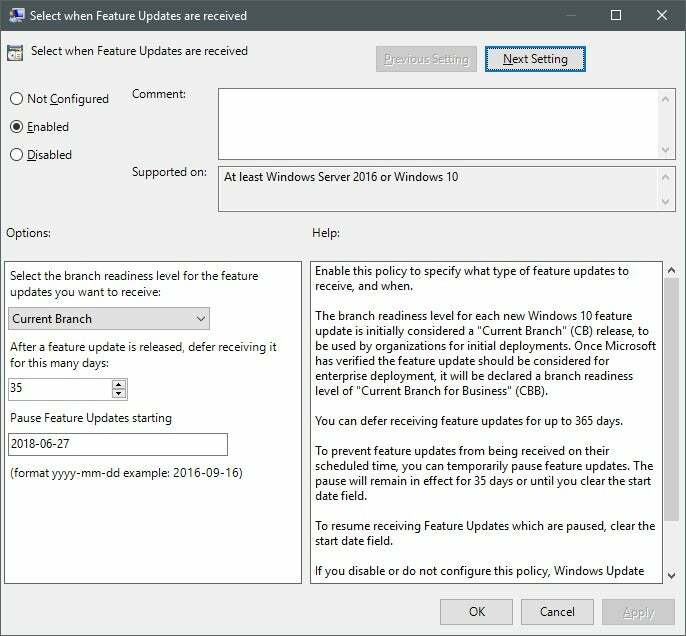 Microsoft doesn't like it when people pause updates, and even using Group Policy you can pause updates for only about 30-35 days, depending on the version of Windows 10 you're using. 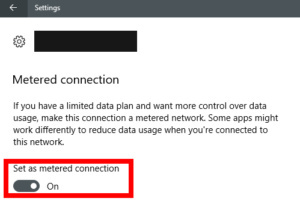 The trick is to tell Windows that you have a metered connection to the Internet—one that can only download so many bits per month without increasing your ISP bill. Microsoft says doing this means "some updates for Windows won't be installed automatically" and some apps may not work as expected.